MELBOURNE, Fla. — It was not the sort of thing the captain of a deep sea fishing vessel wanted to see so far out to sea. 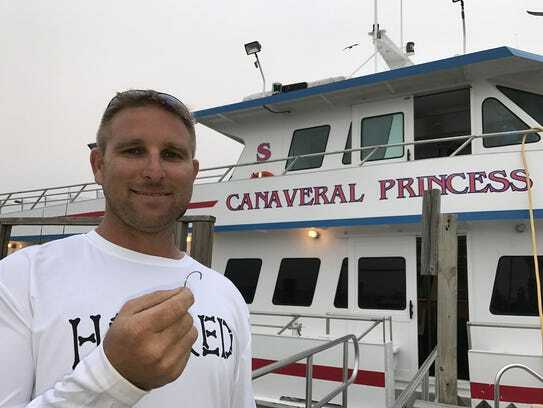 But Monday, Craig Shaffer, 33, of Canaveral Princess, spotted a 14-foot great white shark circling in the clear blue waters about 24 miles off of Port Canaveral, Fla.
“It was actually caught and (Shaffer) hooked it about 100-feet deep in the water,” said Christine Carr, the captain’s sister and spokeswoman for the Orlando Princess and Canaveral Princess Deep Sea Fishing charter boat company at Port Canaveral. There were 21 people and four crewmen aboard the boat, which typically charges $80 for daylong excursions out to sea for bottom fishing. The clients are typically fishing for catch such as grouper or snapper, Carr said. Shaffer, who has been a boat captain since he was 18, helped in the attempt to reel the large predator — a rare sight for the area — in. Great whites can grow up to 4,000 pounds and are known to fiercely rebuff efforts at capture. Can you have one phone for work and play? “The shark ended up breaking off. We ended up getting most of the hook back but the shark actually swam around the boat and turned on its side. It was almost as if it was scoping the boat out and at one point it actually went under the front of the boat,” Carr said.